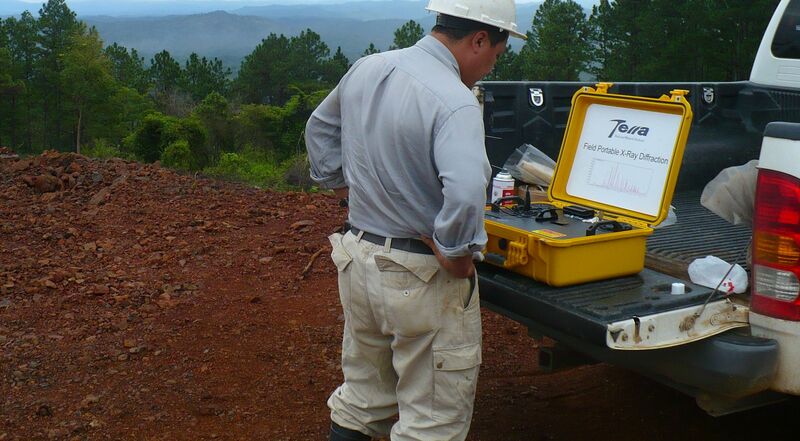 Portable X-ray fluorescence (pXRF) and portable X-ray diffraction (pXRD) are useful tools in aiding the exploration and investigation of lithium-bearing mineral deposits. Current global lithium production is derived from two key deposit types: 1) lithium-bearing pegmatites and 2) lithium brines or salars, with global output divided roughly 50:50 from each source. In this application note, we focus on lithium-bearing pegmatites and the application of Olympus pXRF and pXRD analyzers to these styles of deposits. Figure 1. 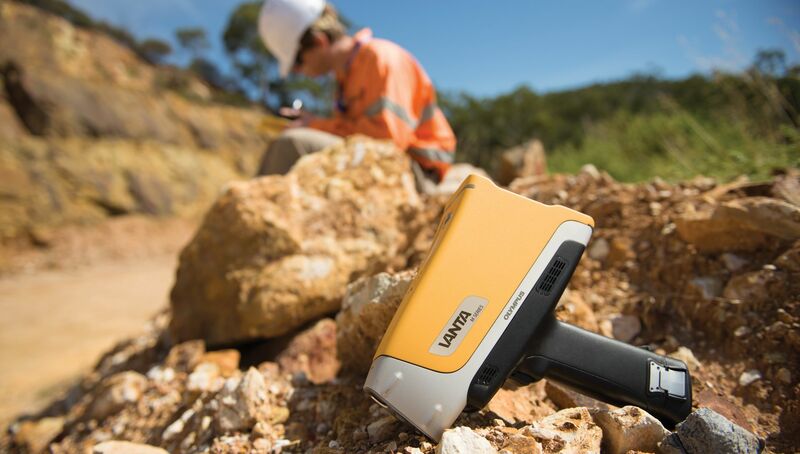 The world-class Greenbushes Li-Ta-Sn LCT pegmatite in Western Australia; an Olympus Vanta™ portable XRF analyzer used for geochemical mineral exploration (upper right); an Olympus TERRA® portable XRD for mineralogy (lower right). Lithium-bearing pegmatites are plutonic rocks formed by the late-stage fractionation and emplacement of fertile, peraluminous granites. They are commonly referred to as lithium-caesium-tantalum (LCT) pegmatites due to the enrichment in the incompatible elements of lithium, caesium, tin, rubidium, and tantalum and are distinguished from other rare-element pegmatites, namely niobium-yttrium-fluorine (NYF), by this diagnostic suite of elements. LCT pegmatites are also generally enriched in fluxing components, including water, fluorine, phosphorus, and boron, and this is evident in their unique geochemical and mineralogical make-up. Mineralogically, LCT pegmatites are dominated by a quartz + K-feldspar + albite + muscovite assemblage and are commonly zoned with the more evolved and fractioned phases such as spodumene (Li), lepidolite (Li), petalite (Li), tantalite-columbite (Ta-Nb), cassiterite (Sn), apatite (P), beryl (Be), tourmaline (B), and garnets occurring within the inner core zones and margins. While direct analysis of lithium is not possible with pXRF due to X-ray physics limitations, the latest generation of instruments can be used effectively to identify a key suite of whole rock and associated pathfinder elements, namely: K, Ca, Rb, Sr, Y, Nb, Sn, Cs, Ta, Sb, W, Bi, As, Ga, Tl, and the rare earth elements (REEs) of La and Ce. Many of these correspond to group 1 alkali metals and high field strength elements (HFSE) on the periodic table. Work completed by Trueman and Cerny (1982) describes a number of correlations used to differentiate rare metalbearing pegmatites from barren pegmatites, including the use of K/Rb ratios, whereby Rb substitutes for K in micas and feldspar during late stage crystallization. They noted that a K/Rb 160 indicates increasing fractionation, and ratios 15 correlate to highly fractioned pegmatites often containing rare metal mineralization, particularly Ta, Nb, Be, Cs, and Li. This is illustrated in figure 2 (next page) which contains sample data from a LCT pegmatite deposit in Southeast Asia, with good agreement between the lab and pXRF for key elements. Figure 2. Lab and pXRF data on lab-pulps from a LCT pegmatite deposit, showing excellent agreement between (a) lab Rb and pXRF Rb; (b) lab Sn and pXRF Sn; (c) lab Li vs Rb; (d) lab Li vs pXRF Rb; (e) lab Li vs pXRF K; and (f) lab Li vs pXRF K/Rb. Data courtesy of Argo Metals Group from a LCT pegmatite project in SE Asia. Identification and assessment of granitic parent rock fertility with respect to hosting potential of LCT pegmatites. Fertile granites exhibit elevated Rb, Cs, Sn, and Ta as well as lower K/Rb ratios than typical granites. Diff erentiating rare metal-bearing pegmatites from barren, more typical pegmatites with granitic composition and to diff erentiate LCT- pegmatites from NYF-pegmatites. A proxy for lithium grade, where a strong correlation exits with pathfi nder elements, Rb in particular, and has been determined by a detailed orientation survey with suffi cient quality laboratory data (shown in fi gure 2). Direct analysis of outcrop, surface soil samples, and drilling cuttings. Sn, Sb, and As, in particular, can be used eff ectively to map out surface anomalies where Li, Cs, K, and Rb have been mobilized and/or depleted. Whole rock chemistry (Mg, Al, Si, K, Ca, and Fe) and immobile trace elements (such as Ti, Zr) for litho-geochemistry to determine deposit stratigraphy, alteration, and pegmatite zonation. The mineralogy of LCT pegmatites can be complex and knowledge of the lithium-bearing phases is often as important as the lithium grade when scoping project viability. This is due to the complexity in processing, liberation, and extraction of some phases and lithium-micas in particular. Table 1 (right) summarizes the key lithium-bearing minerals. Olympus portable XRD (pXRD) technology can provide rapid and inexpensive quantitative mineralogy with minimal sample preparation to provide a complete picture of the pegmatite mineralogy. It can also be used to back-calculate lithium grade once robust quantifi cation has been made. References: Trueman, D. Cerny, P. 1982 Exploration for Rare – element Granitic Pegmatites in Granitic Pegmatites in Science and Industry. Ed. P. Cerny. Min. Assoc. of Canada. pp 463 – 494.